Venture into an exciting new world; forego all preconceived ideas of traditional museum visits, dispel all notions of tiptoeing through silent art galleries to view masterpieces from afar, change how you engage with art. 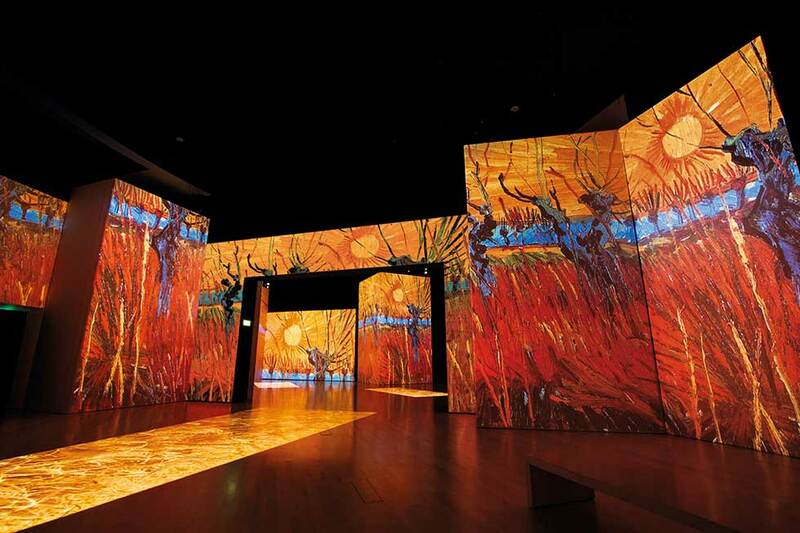 Vitalize your senses and challenge your beliefs in a completely unique, stimulating Van Gogh exhibition experience. Be prepared for a vibrant symphony of light, color and sound, combined and amplified to create what visitors are calling “an unforgettable multi-sensory experience”. In an instant, Van Gogh Alive – The Experience transports visitors to another time and place, immersing them in the artists’ world. Adults and children alike, wander throughout the space, exploring nooks and crannies and engaging with the experience in a manner that transcends traditional installations. Explore the work and life experiences of this prolific artist during the period 1880 to 1890. Interpret his thoughts, feelings and state of mind during his time in Arles, Saint Rémy and Auvers-sur-Oise, the locations where he created many of his timeless masterpieces. See these works in hyper-fine detail, with special attention paid to key features, allowing you time to study color and technique. Photographs and video have also been augmented with Van Gogh’s works to demonstrate his sources of inspiration.